On Twitter, Erin Brenner asked, “How about a post on prescriptivism/descriptivism as a continuum rather than two sides? Why does it have to be either/or?” It’s a great question, and I firmly believe that it’s not an either-or choice. However, I don’t actually agree that prescriptivism and descriptivism occupy different points on a continuum, so I hope Erin doesn’t mind if I take this in a somewhat different direction from what she probably expected. The problem with calling the two part of a continuum is that I don’t believe they’re on the same line. Putting them on a continuum, in my mind, implies that they share a common trait that is expressed to greater or lesser degrees, but the only real trait they share is that they are both approaches to language. But even this is a little deceptive, because one is an approach to studying language, while the other is an approach to using it. I think the reason why we so often treat it as a continuum is that the more moderate prescriptivists tend to rely more on evidence and less on flat assertions. This makes us think of prescriptivists who don’t employ as much facts and evidence as occupying a point further along the spectrum. But I think this point of view does a disservice to prescriptivism by treating it as the opposite of fact-based descriptivism. This leads us to think that at one end, we have the unbiased facts of the language, and somewhere in the middle we have opinions based on facts, and at the other end, where undiluted prescriptivism lies, we have opinions that contradict facts. I don’t think this model makes sense or is really an accurate representation of prescriptivism, but unfortunately it’s fairly pervasive. In its most extreme form, we find quotes like this one from Robert Hall, who, in defending the controversial and mostly prescription-free Webster’s Third, wrote: “The functions of grammars and dictionaries is to tell the truth about language. Not what somebody thinks ought to be the truth, nor what somebody wants to ram down somebody else’s throat, not what somebody wants to sell somebody else as being the ‘best’ language, but what people actually do when they talk and write. Anything else is not the truth, but an untruth.”1In Harold B. Allen et al., “Webster’s Third New International Dictionary: A Symposium,” Quarterly Journal of Speech 48 (December 1962): 434. But I think this is a duplicitous argument, especially for a linguist. If prescriptivism is “what somebody thinks ought to be the truth”, then it doesn’t have a truth value, because it doesn’t express a proposition. And although what is is truth, what somebody thinks should be is not its opposite, untruth. So if descriptivism and prescriptivism aren’t at different points on a continuum, where are they in relation to each other? Well, first of all, I don’t think pure prescriptivism should be identified with evidence-free assertionism, as Eugene Volokh calls it. Obviously there’s a continuum of practice within prescriptivism, which means it must exist on a separate continuum or axis from descriptivism. Descriptivism is concerned with discovering what language is without assigning value judgements. Linguists feel that whether it’s standard or nonstandard, correct or incorrect by traditional standards, language is interesting and should be studied. 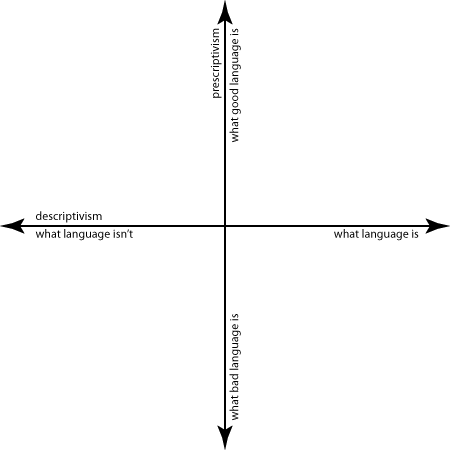 That is, they try to stay on the right side of the graph, mapping out human language in all its complexity. Some linguists like Hall get caught up in trying to tear down prescriptivism, viewing it as a rival camp that must be destroyed. I think this is unfortunate, because like it or not, prescriptivism is a metalinguistic phenomenon that at the very least is worthy of more serious study. Prescriptivism, on the other hand, is concerned with good, effective, or proper language. Prescriptivists try to judge what best practice is and formulate rules to map out what’s good or acceptable. In the chapter “Grammar and Usage” in The Chicago Manual of Style, Bryan Garner says his aim is to guide “writers and editors toward the unimpeachable uses of language” (16th ed., 5.219, 15th ed., 5.201). Reasonable or moderate prescriptivists try to incorporate facts and evidence from actual usage in their prescriptions, meaning that they try to stay in the upper right of the graph. Some prescriptivists stray into untruth territory on the left and become unreasonable prescriptivists, or assertionists. No amount of evidence will sway them; in their minds, certain usages are just wrong. They make arguments from etymology or from overly literal or logical interpretations of meaning. And quite often, they say something’s wrong just because it’s a rule. So it’s clearly not an either-or choice between descriptivism and prescriptivism. The only thing that’s not really clear, in my mind, is how much of prescriptivism is reliable. That is, do the prescriptions actually map out something we could call “good English”? Quite a lot of the rules serve little purpose beyond serving “as a sign that the writer is unaware of the canons of usage”, to quote the usage entry on hopefully in the American Heritage Dictionary (5th ed.). Linguists have been so preoccupied with trying to debunk or discredit prescriptivism that they’ve never really stopped to investigate whether there’s any value to prescriptivists’ claims. True, there have been a few studies along those lines, but I think they’re just scratching the surface of what could be an interesting avenue of study. But that’s a topic for another time. 1. ↑ In Harold B. Allen et al., “Webster’s Third New International Dictionary: A Symposium,” Quarterly Journal of Speech 48 (December 1962): 434.